One of the most beautifully animated and unique video slots in NetEnt’s production library is Gonzo’s Quest video slot. This slot game features an opening video that shows you the story of Gonzo and the quest he is about to embark on. 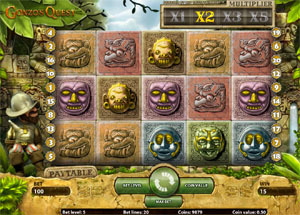 NetEnt’s Gonzo’s Quest: The Search for Eldorado video slot was released in 2010 and became a true online video slot classic. The video slot will start with the main game screen, followed by the appearance of Gonzo to the left of the blocks. He stands there, watching as you play and keeping guard against the perils of the surrounding jungle. The animations are smooth and vivid, and Gonzo himself will cheer you on when you win big or create avalanches. Most NetEnt games have some form of wild symbols that can appear for increased chances to win big payouts. Gonzo’s Quest video slot is no different, as it uses wilds as well. The real unique feature of Gonzo’s Quest is the Avalanche feature. Instead of the reels spinning, like in traditional slot games, they fall into place on the reels to form the symbol patterns and possible winning lines. The beauty of the Avalanche feature, which clearly takes a little from the Tetris playbook, is that when you do get matching symbols, they will explode and allow new symbols to fall into their place. This can lead to big payouts, as well as multiple payouts if avalanches keep happening. Getting the right 3 symbols results in a free fall, which causes another avalanche to begin. A free fall is Gonzo’s Quest video slot’s version of Free Spins. 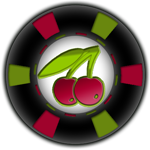 All avalanche and free fall wins are won using the initial bet level and coin value as the spin that activated it. All winning lines are calculated from left to right. 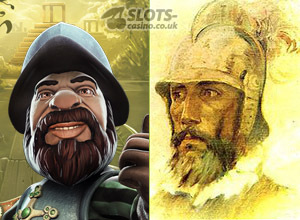 The Gonzo’s Quest video slot is based on Gonzalo Pizarro, who was a 16th century a Spanish conquistador. He was the half-brother of Francisco Pizarro, who conquered the Inca Empire in Peru. In the introduction video of the slot, you can see Gonzo who jumps off a boat just off the coast of Peru, and instead of fighting with the Spanish to conquer the Inca Empire he goes off on his own quest, the search for Eldorado. In February of 1541, the real Gonzalo Pizarro went on an expedition. He left Quito (Peru’s capital) and went out to explore the eastern part of Peru. On his way, he tortured and killed every Indian who would not co-operate with him. The word spread quickly under Indians, and the Indians started to make up stories about El Dorado, the golden city. The rumours were that the mythical golden city was probably located in Colombia or Venezuela. Gonzalo never found any gold, and he returned after a one and a half year quest back to Quito. During his search for El Dorado, Gonzalo Pizarro pretty much massacred all the Inca people he came across. Anyway, that was the history part for today, let’s just put it that NetEnt made a happier video slot which is based on 16th-century myths and legends. 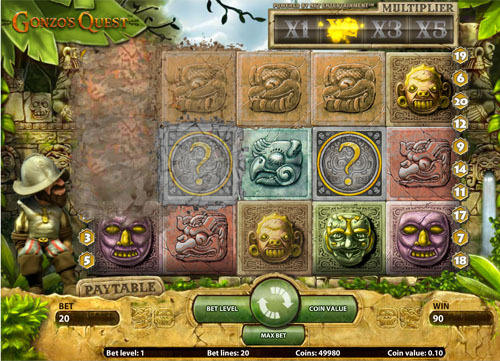 I can’t think of any other Inca themed slot machines, so it is pretty original of NetEnt to come up with this theme. It seems like the Mayas and Aztec are more interesting to make slots about, since IGT has the Mayan Riches video slot, Microgaming has Mayan Princess and Aztec themed Montezuma slot. 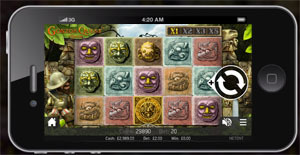 Maybe one or two symbols of those Mayan video slots look a bit like a Gonzo’s Quest symbol, but to be honest, I don’t find the Mayan Riches nor the Mayan Princess interesting enough to play. It’s maybe not completely political and historically correct, but I made an overview page about video slots with an Inca, Maya or Aztec theme. Yes, I do know they are three totally different cultures, but well the Aztec, Maya and Inca video slots all share the same vibe. After Gonzo’s Quest became such a popular video slot other software companies made clones of Gonzo’s Quest, so now there are a couple of slots with the same theme, including Betsoft’s Rook’s Revenge and Stakelogic’s King Bam Bam. Features: Cascading Reels, Avalanche feature, Free Falls, Wild symbols. You can play the Gonzo’s Quest slot for free, or with real money, but if you just want to know what the Gonzo’s Quest looks like you can check the Youtube video clip. In this short clip you will see a demo play of the video slot and this way you will see the Avalanche system in action. The video demo also shows what it looks like when Gonzo finds the city of Eldorado, and receives the free falls. When Gonzo’s Quest was first released in January 2010 hardly anyone used their mobile phone to play casino games, and the iPad did not even exist yet. So no surprise that at first you were not able to play Gonzo’s Quest on mobile phones and tablets. Luckily NetEnt caught on and made a special HTML5 version of Gonzo’s Quest, which you can play on iOS, Android and Windows Mobile devices. The Gonzo’s Quest Touch version of the game is almost the same as the desktop/computer/laptop version of the game. The biggest difference is that Gonzo is not dancing when you hit a win, and the buttons are in a slightly different location, so it is easier to touch them while holding your smartphone or tablet. NetEnt has a lot different slot machines, but Gonzo’s Quest video slot is truly unique. Other NetEnt games such as Twin Spin, have a totally different look and feel. Sparks is a great slots game, but has a different look and feel from Gonzo’s Quest, as well as an entirely different spin system. Gonzo’s Quest video slot has the power to entertain and the chance to win real money all wrapped into a beautifully animated package. NetEnt usages the Avalanche system in other video slots, like the Pyramid: Quest for Immortality video slot, the Elements slot, the Fruit Case slot and the Cosmic Fortune, but those video slots have a totally different look and feel to the game. You can play this --and other NetEnt video slots-- with real money at one of the following online casinos: Unibet, Vera&John, and Royal Panda.